Enough- Do We Just Keep Saying It or Do We Mean It? I decided to be deliberate. I wrote down those things I felt were my “enough” items. I prayed over them during the course of the weekend. I was reminded most of what I had had “enough” of, was worldly. We run, racing from one event to another. We fill our kids’ schedules to overflowing afraid they won’t make the team, or be “in” with the right group if we don’t keep up. We choose athletic practices over Sunday evening bible study or Wednesday discipleship. We choose extra curricular activities, social events over dinner around the table with family. We guilt ourselves into being at every church event lest those church ladies begin to gossip and judge our spirituality. We run. We race. We grow weary. God took me back to a scripture so well know. Romans 12:3. 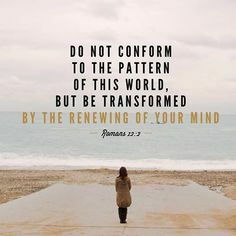 “Be not conformed.” How easily we read the words. Many of us can quote them as easily as we quote John 3:16. But do we live them? I don’t. In those moments of “enough” I realize I vital the scripture is. God calls me to live differently. My life, my calendar should not look like everyone else’s. It should not resemble the calendar of one who does not serve the risen God. My life should look different. My calendar should look different. His pattern leads to refreshment, peace, joy in the midst of trials. His path leads to victory as I release the hurts and fears to Him. I have to make a choice to renew my mind. I can’t keep racing. I can’t just keep going. I have a decision to make. In that moment of “enough” if I am to live transformed, I must stop and ask myself, “Is this necessary? Is this the best for me, for my kids, for our family?” I don’t have to just say, “Enough” and carry on. I need to stop. I need to let my “Enough” be a sincere word, an end to the crazy running, striving, seeking affirmation. “Enough” should drive me to my quiet place, the sitting in stillness asking for Him to speak, give me scripture, guidance. “Enough” should drive me to live transformed, to quit living conformed. I challenge you today. If you have uttered the word “enough” in recent days. Go back. What is it you have had “enough” of?Dare to let the “enough” drive you to deliberateness of thought, action. Dare to stand out from the crowd. Dare to live as you, as I, as we His church have been called to live-transformed. 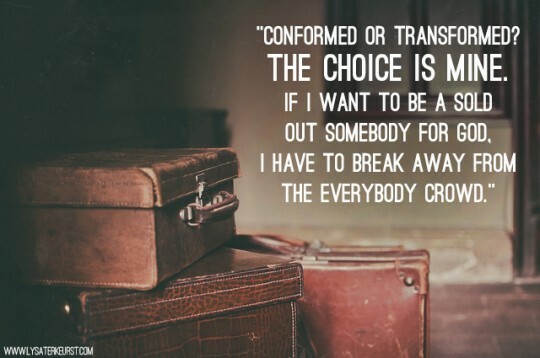 Quit being conformed. Enough is enough.